I took some time to look through my holdings and make more stringent what I consider a Core holding and what are Supporting positions. When building my portfolio I started with the core positions as they are my foundation. I then diversified with more aggressive higher growth companies in the speculative areas. Supporting companies are a way I diversify away from non-cyclical consumer staples-like corporations. A lot of my supporting companies are in discretionary, industrials, or material sectors that suffer from down years but grow quickly on up years. Super Core: Have all the qualities of a Core position but also a strong credit rating. Must be rated with a financial rating of A+ or higher by S&P, a Value Line financial rating of A++, and have a Value Line safety of 1. Core: Less cyclical more stable businesses. Have long track records and most are dividend aristocrats. offer products and services people use all the time even during bad economic times. I will likely hold these for life unless the business environment changes substantially and the dividend gets harmed. The goal with these types of companies is to build a foundation that offers consistent predictable dividend income to live off of. Capital appreciation is secondary to the dividend and the growth of that dividend. Speculative: Bought for capital gain purposes. If the direction of the stock is heading the wrong way I will sell and move on. Dominion (D) and WEC Energy (WEC): I moved these from Core to Supporting. It does not meet the quality metrics of better utilities like Next Era Energy (NEE). Illinois Tool Works (ITW): It is not as stable as a 3M during economic recessions. It is more cyclical. However, it is a very well run company (dividend aristocrat) and the growth has been spectacular. I am putting this as a Supporting position behind 3M. Air Products & Chemicals (APD): Materials is a cyclical industry. I moved this to Supporting. Kraft Heinz Co (KHZ): I have more stable packaged food companies that have more established histories. MKC and GIS I have as core since the history is more established. KHZ's balance sheet is not the cleanest and it only has a BBB- credit rating. I label this now as Supporting. Stryker (SYK): Moved it to Supporting behind my core positions like JNJ and BDX and MDT. SYK is a great company with a strong credit rating and balance sheet. Good growth and stable growth. But it is overshadowed by my "big 3" healthcare stocks. I also recently bought a new position in General Dynamics (GD). GD is a Supporting position for me. The business is less diversified than a 3M and it's a cyclical business. It has the cleanest balance sheet of all the defense companies, and it is a dividend aristocrat with a proven track record. I added around $2200 in Next Era Energy (NEE) today. The positions were in my 401k. NEE yields around 2.66% so $2200 is around $58 in annual dividends. I did several transactions today in my brokerage to finish all of my tax loss harvesting for 2017. I should net around $3000 in losses which I will use to reduce my taxable income this year. I estimate that I can get around $1000 in state and federal tax credit back, so my loss will be reduced to $2000. Several of these trades are temporary and I will be looking to revert some of them back after the wash 30 day rule. 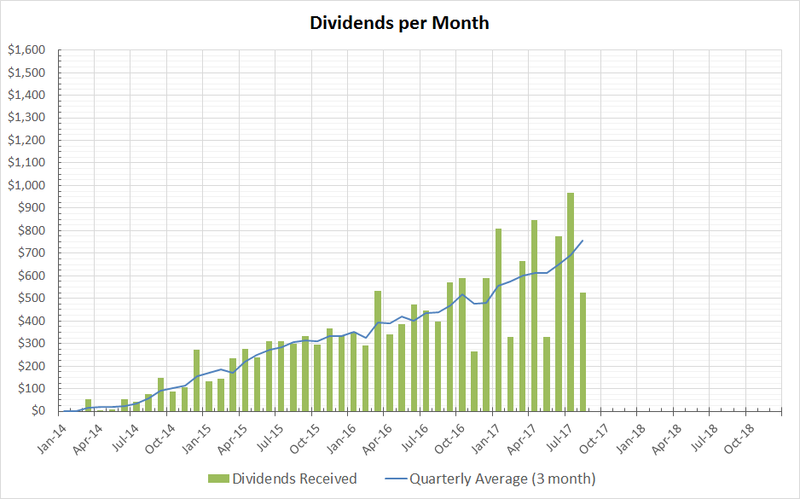 My portfolio's dividend income has dropped due to the temporary positions but it should be over the $10,000 in dividends a year relatively quickly in a few weeks as more cash piles in. Selling is rare in my portfolio. The usual time I sell is to harvest -$3000 in losses each year since the taxes I pay each year are high. I also take this time to offset the gains from positions that are being bought out. I get 100 free trades a month with my broker. So all these trades were done free. I paid around 12-14 cents per sell because the SEC charges a sell fee, so I probably paid up to a $1.00 in SEC sell fees. I intend to buy back Hormel after the 30 day period but the position will likely first start at $3k, I won't be buying back all $6k at once. I am not a fan of its low yield, it needs to be higher. I prefer a 2.5% or higher yield on HRL. I intend to buy back General Mills after the 30 day period if it falls to a 4% yield. I do not have an urge to buy back SJM if I buy back GIS/HRL. It's a secondary quality stock on my list, behind GIS and HRL (who are in the same food sector that is getting hit hard right now). I would rather pickup a utility company with a higher yield than what SJM sports today. I intend to buy back KMB after the 30 day period. I still hold a relatively decent position. Starbucks is a hold to me. I do not have an urge to buy it back after the 30 day period. I tend to limit how much consumer discretionary companies I buy. I want to fill up my utilities, healthcare, and industrials before I add more to discretionary stocks. KHZ is a hold to me. I do not have an urge to buy it back after the 30 day period as I still hold a chunk of it. If it goes over 3.6% yield that will interest me. I will be selling BTI to buy back my MO after 30 days. I'll keep the PM as it is so in the end my position of MO to PM will roughly be evenly split (50 / 50). I like the MO business and it feels awkward to have sold it for the temporary 30 days. I already had the stock on the ex-dividend so I will get the fat dividend check next month. I am hoping any gains in tobacco will be felt by the BTI's American position in RAI (Reynolds American). PM and international segment of BTI trade rather differently than American MO now. There isn't another tobacco American company I can really replace MO with temporarily, VGR isn't really a good pick. So I stuck with BTI and its ownership of RAI. I offset the losses with two gain sells. BCR is being acquired so I will have to sell soon as BDX is acquiring it this fall. WTR I sold because the position was way too small and I did not want to follow another utility small position in my portfolio. WTR is a great company but I hold a lot of good utilities already that yield higher %. 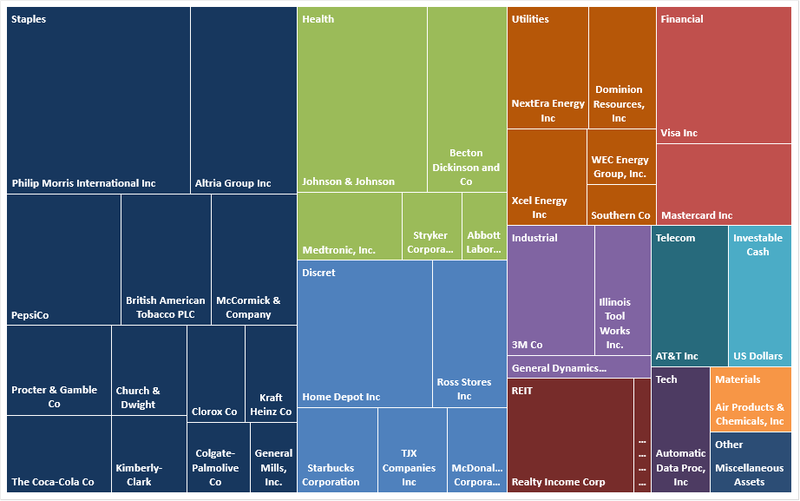 Here is a treemap showing how my portfolio currently stands. Overall the distributions remain relatively similar. I have tried to increase my weighting in healthcare and utilities and industrials so that my portfolio is more diversified. I'll write back on October 23 when I revert some of my tax loss harvest trades! Stay tuned. I did some homework yesterday to review what the number of outstanding shares looks like for each of the companies that I hold. As a background, companies usually buy back shares to reduce the number of outstanding shares on the open market. Companies are measured by earnings per share (EPS). This is done by dividing total earnings of the company by the total number of shares on the market. With a lower share count, the EPS goes higher. Also with a lower share count, the company does not have to dish out so much cash to pay for all those quarterly dividends.For example Coca Cola pays 37 cents per dividend every quarter. If they bought back 10,000,000 shares back for $460,000,000 then they would be able to save paying $14.8M a year in dividends. Companies can also dilute shares. Sometimes a company needs to finance a large acquisition. Or maybe the company needs more money for various reasons to operate. Diluting shares is bad for investors unless the money spent is able to add more to the earnings relative to how much dilution occurs. Usually debt heavy industries such as real estate and utilties dilute shares to fund expansion. With each new share sold on the open market, the amount of dividend dollars a company needs to pay increases. Every new share needs to be paid the dividend making the dividend burden even bigger. I get my share data from Morningstar. I look at a 5 year window up to 2016 and just divide the percentage decline or increase over that 5 year period to get a rough estimate of how much the company on average changes the number of shares. The example above shows Illinois Tool Works (ITW). In my portfolio this company has been the best at reducing share count over a 5 year window and they are also a very well performing dividend aristocrat with rising earnings per share. The share count at the end of 2016 was 357M and it was only 495M 5 years earlier. This is a very impressive decrease of 5.5-6% a year. I did this investigation for all of my holdings. I noticed that a lot of my best portfolio performers have very nice share count decreases. These include ITW, Home Depot (HD), Visa (V), MasterCard (MA), Ross Stores (ROST), and 3M (MMM). Most of my normal "C" Corps have made an attempt to reduce or at least keep the number of shares flat. Keep in mind companies do pay their execs and employees stock for bonuses and incentives. Companies have to keep buying these stock back in order to avoid diluting the share base. Some companies are the product of mergers and acquisitions so I was not able to really get a good idea of share count growth or decline. The Utilties and REIT space are the worst sectors in terms of minimizing share count. I don't own any MLPs but MLPs also operate similarly. Realty Income (O) has increased the number of shares drastically from 126M in 2011 to 256M in 2016. This is basically a doubling of the number of shares in just 5 years. REITs need to make public offerings to acquire cash for purchasing additional properties. REITs pay the large majority of their earnings back to the share holders, which means they cannot keep a lot of the money they earn. Diluting the share base is the way they can fund their expansion. If the expansion purchases add more to the bottom line compared to the dilution of shares, then the overall company performance will continue increasing. This can be seen in well managed REITs like FRT and O. However, the dilution of shares still concerns me which is why I do not have a super large position in REITs. Although share buybacks are important. It is not the panacea for increasing company earnings per share. I would rather see executives invest in the company organically instead of financially engineering the company's earning statistics. Buying back stock can only work so much but one must innovate and keep up with the competition by having good products and services. That requires investment back into the company and buying back shares is only a way to "cheat" in the short term. Additionally, companies oftentimes buy shares back at market highs since that is when the company is doing their best and spare cash is abundant. That money might have been better used in dividends or company reinvestment or acquisitions. This is the August portfolio summary report. I will be using data up to the September 11, 2017 period. I will first summarize what happened in the market in the last month. The dollar continues to weaken. This is great for my portfolio as most of my portfolio has companies that deal internationally. A weaker dollar means more US dollars recovered when they convert their foreign earnings to US dollars. A weaker dollar allows our US products to compete more competitively in price on foreign lands. The S&P500 has retreated in August. August, September, and October are usually more volatile months and corrections are common in the last few years. I always took advantage of the declines but it seems our market now has largely recovered. The S&P500 is hitting all time highs again but my portfolio has not since many of the gainer industries are not in my portfolio (I tend to hold very low volatility stocks so my portfolio does not usually follow so extremely with the S&P500). In the news, there were a lot of concern over the North Korea nuclear testing situation, Trump's inability to get any movement on tax reform or repatriation, the destruction of Hurricane Harvey and Irma, and the US debt ceiling. I used to monitor oil very closely in the past. My portfolio does not contain any companies that directly deal with oil. But I still track the oil market since this commodity is so crucial to our economy. Oil has stayed relatively flat. It is still very cheap, sub $50. This new environment of very cheap oil is likely to stay for a very long time. It is going to be very hard for any oil company in this environment. I tend to stick out of the oil business in general as countries aim to phase out gas powered cars for alternatives, and the world becomes less reliant on oil. I cannot see oil being a dominant source of energy in 70+ years. I cannot see all of our oil pipelines being usable in the future as oil reserves get all mined out, eventually they'll all be retired. I invest for the decades and the future. If a company's core product is no longer going to be here then I will not invest in it. I can see toilet paper and toothpaste and laundry detergent being here in 100 years time, but oil not so much. As of today my portfolio's annual dividend has crossed 5 figures. On an annual basis, my portfolio is expected to generate $10,028 in dividends per year. This is before taxes of course, and barring any disasters that causes one of the companies I own shares in to go bankrupt. In total I invested around $3000 today. The high payer was AT&T followed by General Mills and Procter & Gamble. August is a weak month, along with the months of 2, 5, and 11 in the year since not many of the companies I hold pay in those months. For September I am expecting around $880 to be cashed into my brokerage account. And for October I am expecting $1020. If I take the quarterly moving average since month to month can be volatile, the trend is a nice upward increase in my monthly dividends. This is largely due to the contributions I put into my portfolio every month and the results are showing. I expect that my portfolio is able to grow the dividend by around 10% year over year by itself. This growth is from around 2-3% in dividend yield reinvested from my various portfolio positions (on average) plus the 7-8% of natural dividend growth from each of the holdings (on average) I have in my portfolio. September and October tend to be very bad months for the year. I can already see my portfolio falling slightly despite my biweekly cash contributions trying to prop the portfolio up from market weakness. I am stocking up on cash for the coming weeks. I will post buy activities when they happen.